Lancashire (, [ˈɫaŋkɪʃə(ɻ)]; archaically the County Palatine of Lancaster; abbreviated Lancs.) is a non-metropolitan ceremonial county in north west England. The county town is Lancaster although the county's administrative centre is Preston. The county has a population of 1,449,300 and an area of 1,189 square miles (3,080 km2). People from Lancashire are known as Lancastrians. The history of Lancashire begins with its founding in the 12th century. In the Domesday Book of 1086, some of its lands were treated as part of Yorkshire. The land that lay between the Ribble and Mersey, Inter Ripam et Mersam, was included in the returns for Cheshire. When its boundaries were established, it bordered Cumberland, Westmorland, Yorkshire, and Cheshire. Lancashire emerged as a major commercial and industrial region during the Industrial Revolution. Liverpool and Manchester grew into its largest cities, dominating global trade and the birth of modern industrial capitalism. The county contained several mill towns and the collieries of the Lancashire Coalfield. By the 1830s, approximately 85% of all cotton manufactured worldwide was processed in Lancashire. Accrington, Blackburn, Bolton, Burnley, Bury, Chorley, Colne, Darwen, Manchester, Nelson, Oldham, Preston, Rochdale and Wigan were major cotton mill towns during this time. Blackpool was a centre for tourism for the inhabitants of Lancashire's mill towns, particularly during wakes week. The county was subject to significant boundary reform in 1974 that removed Liverpool and Manchester and most of their surrounding conurbations to form the metropolitan counties of Merseyside and Greater Manchester. The detached northern part of Lancashire in the Lake District, including the Furness Peninsula and Cartmel, was merged with Cumberland and Westmorland to form Cumbria. Lancashire lost 709 square miles of land to other counties, about two fifths of its original area, although it did gain some land from the West Riding of Yorkshire. Today the county borders Cumbria to the north, Greater Manchester and Merseyside to the south and North and West Yorkshire to the east; with a coastline on the Irish Sea to the west. The county palatine boundaries remain the same with the Duke of Lancaster exercising sovereignty rights, including the appointment of lords lieutenant in Greater Manchester and Merseyside. The county was established in 1182, later than many other counties. During Roman times the area was part of the Brigantes tribal area in the military zone of Roman Britain. The towns of Manchester, Lancaster, Ribchester, Burrow, Elslack and Castleshaw grew around Roman forts. In the centuries after the Roman withdrawal in 410AD the northern parts of the county probably formed part of the Brythonic kingdom of Rheged, a successor entity to the Brigantes tribe. During the mid-8th century, the area was incorporated into the Anglo-Saxon Kingdom of Northumbria, which became a part of England in the 10th century. In the Domesday Book, land between the Ribble and Mersey were known as "Inter Ripam et Mersam" and included in the returns for Cheshire. Although some historians consider this to mean south Lancashire was then part of Cheshire, it is by no means certain. It is also claimed that the territory to the north formed part of the West Riding of Yorkshire. It bordered on Cumberland, Westmorland, Yorkshire, and Cheshire. The county was divided into hundreds, Amounderness, Blackburn, Leyland, Lonsdale, Salford and West Derby. Lonsdale was further partitioned into Lonsdale North, the detached part north of the sands of Morecambe Bay including Furness and Cartmel, and Lonsdale South. Lancashire is smaller than its historical extent following a major reform of local government. In 1889, the administrative county of Lancashire was created, covering the historical county except for the county boroughs such as Blackburn, Burnley, Barrow-in-Furness, Preston, Wigan, Liverpool and Manchester. The area served by the Lord-Lieutenant (termed now a ceremonial county) covered the entirety of the administrative county and the county boroughs, and was expanded whenever boroughs annexed areas in neighbouring counties such as Wythenshawe in Manchester south of the River Mersey and historically in Cheshire, and southern Warrington. It did not cover the western part of Todmorden, where the ancient border between Lancashire and Yorkshire passes through the middle of the town. During the 20th century, the county became increasingly urbanised, particularly the southern part. To the existing county boroughs of Barrow-in-Furness, Blackburn, Bolton, Bootle, Burnley, Bury, Liverpool, Manchester, Oldham, Preston, Rochdale, Salford, St. Helens and Wigan were added Blackpool (1904), Southport (1905), and Warrington (1900). The county boroughs also had many boundary extensions. The borders around the Manchester area were particularly complicated, with narrow protrusions of the administrative county between the county boroughs – Lees urban district formed a detached part of the administrative county, between Oldham county borough and the West Riding of Yorkshire. By the census of 1971, the population of Lancashire and its county boroughs had reached 5,129,416, making it the most populous geographic county in the UK. The administrative county was also the most populous of its type outside London, with a population of 2,280,359 in 1961. On 1 April 1974, under the Local Government Act 1972, the administrative county was abolished, as were the county boroughs. The urbanised southern part largely became part of two metropolitan counties, Merseyside and Greater Manchester. The new county of Cumbria incorporates the Furness exclave. The boroughs of Liverpool, Knowsley, St. Helens and Sefton were included in Merseyside. In Greater Manchester the successor boroughs were Bury, Bolton, Manchester, Oldham (part), Rochdale, Salford, Tameside (part), Trafford (part) and Wigan. Warrington and Widnes, south of the new Merseyside/Greater Manchester border were added to the new non-metropolitan county of Cheshire. The urban districts of Barnoldswick and Earby, Bowland Rural District and the parishes of Bracewell and Brogden and Salterforth from Skipton Rural District in the West Riding of Yorkshire became part of the new Lancashire. One parish, Simonswood, was transferred from the borough of Knowsley in Merseyside to the district of West Lancashire in 1994. In 1998 Blackpool and Blackburn with Darwen became independent unitary authorities. The Wars of the Roses tradition continued with Lancaster using the red rose symbol and York the white. Pressure groups, including Friends of Real Lancashire and the Association of British Counties advocate the use of the historical boundaries of Lancashire for ceremonial and cultural purposes. Lancashire, the shire county controlled by the county council is divided into local government districts, Burnley, Chorley, Fylde, Hyndburn, Lancaster, Pendle, Preston, Ribble Valley, Rossendale, South Ribble, West Lancashire, and Wyre. Blackpool and Blackburn with Darwen are unitary authorities do not come under county council control. The Lancashire Constabulary covers the shire county and the unitary authorities. The ceremonial county, including the unitary authorities, borders Cumbria, North Yorkshire, West Yorkshire, Greater Manchester and Merseyside in the North West England region. The highest point of the county is Gragareth, near Whernside, which reaches a height of 627 m (2,057 ft). Green Hill near Gragareth has also been cited as the county top. The highest point within the historic boundaries is Coniston Old Man in the Lake District at 803 m (2,634 ft). Lancashire rivers drain westwards from the Pennines into the Irish Sea. Rivers in Lancashire include the Ribble, Wyre and Lune. Their tributaries are the Calder, Darwen, Douglas, Hodder, and Yarrow. The Irwell has its source in Lancashire. To the west of the county are the West Lancashire Coastal Plain and the Fylde coastal plain north of the Ribble Estuary. Further north is Morecambe Bay. Apart from the coastal resorts, these areas are largely rural with the land devoted to vegetable crops. 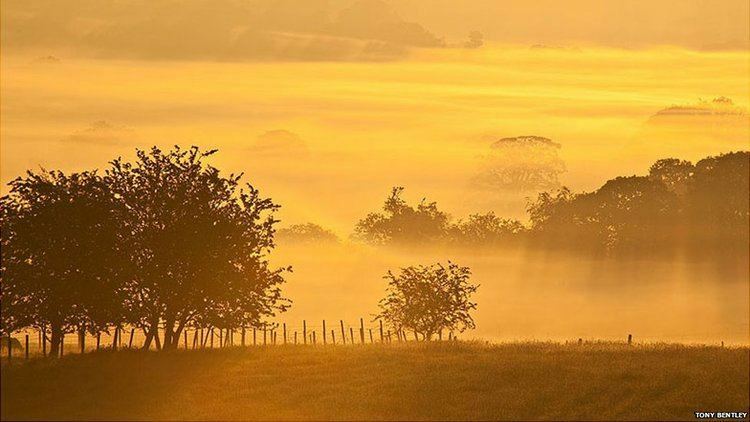 In the northwest corner of the county, straddling the border with [Cumbria, is the Arnside and Silverdale Area of Outstanding Natural Beauty (AONB), characterised by its limestone pavements and home to the Leighton Moss nature reserve. To the east of the county are upland areas leading to the Pennines. 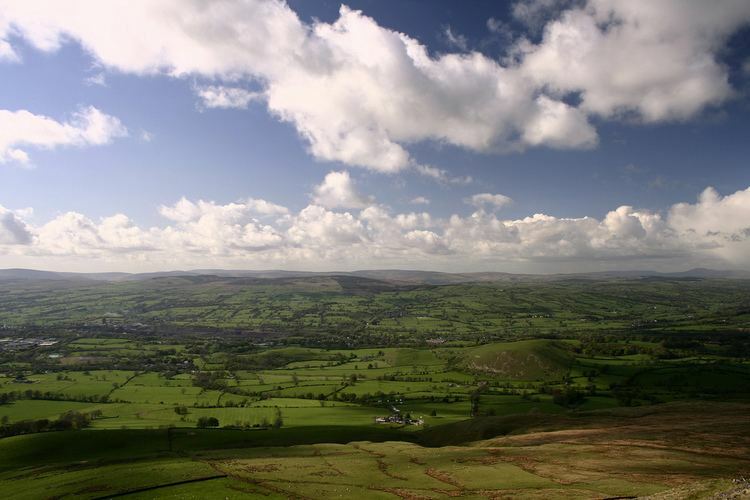 North of the Ribble is Beacon Fell Country Park and the Forest of Bowland, another AONB. Much of the lowland in this area is devoted to dairy farming and cheesemaking, whereas the higher ground is more suitable for sheep, and the highest ground is uncultivated moorland. The valleys of the River Ribble and its tributary the Calder form a large gap to the west of the Pennines, overlooked by Pendle Hill. 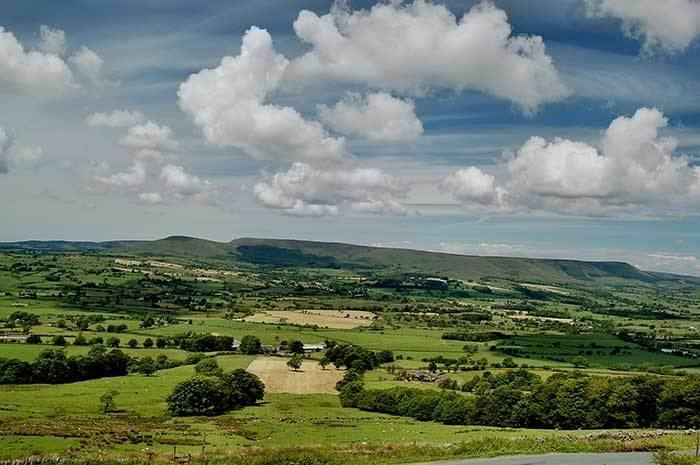 Most of the larger Lancashire towns are in these valleys South of the Ribble are the West Pennine Moors and the Forest of Rossendale where former cotton mill towns are in deep valleys. The Lancashire Coalfield, largely in modern-day Greater Manchester, extended into Merseyside and to Ormskirk, Chorley, Burnley and Colne in Lancashire. Lancashire County Council is based in County Hall in Preston, It was built as a home for the county administration, the Quarter Sessions and Lancashire Constabulary) and opened on 14 September 1882. Local elections for 84 councillors from 84 divisions are held every four years. The council is currently No Overall Control with the Labour Party leading a minority administration. The Duchy of Lancaster is one of two royal duchies in England. It has landholdings throughout the region and elsewhere, operating as a property company, but also exercising the right of the Crown in the County Palatine of Lancaster. While the administrative boundaries changed in the 1970s, the county palatine boundaries remain the same as the historic boundaries. As a result, the High Sheriffs for Lancashire, Greater Manchester and Merseyside are appointed "within the Duchy and County Palatine of Lancaster". The High Sheriff is an ancient county officer, but is now a largely ceremonial post. High Shrievalties are the oldest secular titles under the Crown, in England and Wales. The High Sheriff is the representative of the monarch and is the "Keeper of The Queen's Peace" in the county, executing judgements of the High Court. The Duchy administers bona vacantia within the County Palatine, receiving the property of persons who die intestate and where the legal ownership cannot be ascertained. There is no separate Duke of Lancaster, the title merged into the Crown many centuries ago – but the Duchy is administered by the Queen in Right of the Duchy of Lancaster. A separate court system for the county palatine was abolished by Courts Act 1971. A particular form of The Loyal Toast, 'The Queen, Duke of Lancaster' is in regular use in the county palatine. Lancaster serves as the county town of the county palatine. Lancashire in the 19th century was a major centre of economic activity, and hence of wealth. Activities included coal mining, textile production, particularly cotton, and fishing. Preston Docks, an industrial port are now disused for commercial purposes. Lancashire was historically the location of the port of Liverpool while Barrow-in-Furness is famous for shipbuilding. As of 2013, the largest private sector industry is the defence industry with BAE Systems Military Air Solutions division based in Warton on the Fylde coast. The division operates a manufacturing site in Samlesbury. Other defence firms include BAE Systems Global Combat Systems in Chorley, Ultra Electronics in Fulwood and Rolls-Royce plc in Barnoldswick. The nuclear power industry has a plant at Springfields, Salwick operated by Westinghouse and Heysham nuclear power station is operated by British Energy. Other major manufacturing firms include Leyland Trucks, a subsidiary of Paccar building the DAF truck range. Airline Network, an internet travel company with headquarters in Preston. Baxi, a heating equipment manufacturer has a large manufacturing site in Bamber Bridge. Crown Paints, a major paint manufacturer based in Darwen. Enterprise plc, one of the UK's leading support services based in Leyland. Hanson plc, a building supplies company operates the Accrington brick works. Hollands Pies, a major manufacturer of baked goods based in Baxenden near Accrington. National Savings and Investments, the state-owned savings bank, which offers Premium Bonds and other savings products, has an office in Blackpool. Thwaites Brewery, a regional brewery founded in 1807 by Daniel Thwaites in Blackburn. Xchanging, a company providing business process outsourcing services, with operations in Fulwood. Fisherman's Friend, a confection company, famous for making strong mints and lozenges. The Foulnaze cockle fishery is in Lytham. It has only opened the coastal cockle beds three times in twenty years; August 2013 was the last of these openings. The creation of Lancashire Enterprise Zone was announced in 2011. It was launched in April 2012, based at the airfields owned by BAE Systems in Warton and Samlesbury. Warton Aerodrome covers 72 hectares (180 acres) and Samlesbury Aerodrome is 74 hectares. Development is coordinated by Lancashire Enterprise Partnership, Lancashire County Council and BAE Systems. The first businesses to move into the zone did so in March 2015, at Warton. In March 2015 the government announced a new enterprise zone would be created at Blackpool Airport, using some airport and adjoining land. Operations at the airport will not be affected. This is a chart of trend of regional gross value added of the non-metropolitan county of Lancashire at basic prices published by the Office for National Statistics with figures in millions of British pounds sterling. Lancashire has a mostly comprehensive system with four state grammar schools. Not including sixth form colleges, there are 77 state schools (not including Burnley's new schools) and 24 independent schools. The Clitheroe area has secondary modern schools. Sixth form provision is limited at most schools in most districts, with only Fylde and Lancaster districts having mostly sixth forms at schools. The rest depend on FE colleges and sixth form colleges, where they exist. South Ribble has the largest school population and Fylde the smallest (only three schools). Burnley's schools have had a new broom and have essentially been knocked down and started again in 2006. There are many Church of England and Catholic faith schools in Lancashire. Lancashire is home to four universities: Lancaster University, the University of Central Lancashire, Edge Hill University and the Lancaster campus of the University of Cumbria. Seven colleges offer higher education courses. The Lancashire economy relies strongly on the M6 motorway which runs from north to south, past Lancaster and Preston. The M55 connects Preston to Blackpool and is 11.5 miles (18.3 km) long. The M65 motorway from Colne, connects Burnley, Accrington, Blackburn to Preston. The M61 from Preston via Chorley and the M66 starting 500 metres (0.3 mi) inside the county boundary near Edenfield, provide links between Lancashire and Manchester] and the trans-Pennine M62. The M58 crosses the southernmost part of the county from the M6 near Wigan to Liverpool via Skelmersdale. Other major roads include the east-west A59 between Liverpool in Merseyside and Skipton in North Yorkshire via Ormskirk, Preston and Clitheroe, and the connecting A565 to Southport; the A56 from Ramsbottom to Padiham via Haslingden and from Colne to Skipton; the A585 from Kirkham to Fleetwood; the A666 from the A59 north of Blackburn to Bolton via Darwen; and the A683 from Heysham to Kirkby Lonsdale via Lancaster. The West Coast Main Line provides direct rail links with London and other major cities, with stations at Preston and Lancaster. East-west connections are carried via the East Lancashire Line between Blackpool and Colne via Lytham, Preston, Blackburn, Accrington and Burnley. The Ribble Valley Line runs from Bolton to Clitheroe via Darwen and Blackburn. There are connecting lines from Preston to Ormskirk and Bolton, and from Lancaster to Morecambe, Heysham and Skipton. Blackpool Airport are no longer operating domestic or international flights, but it is still the home of flying schools, private operators and North West Air Ambulance . Manchester Airport is the main airport in the region. Liverpool John Lennon Airport is nearby, while the closest airport to the Pendle Borough is Leeds Bradford. There is an operational airfield at Warton near Preston where there ia a major assembly and test facility for BAE Systems. Heysham offers ferry services to Ireland and the Isle of Man. As part of its industrial past, Lancashire gave rise to an extensive network of canals, which extend into neighbouring counties. These include the Leeds and Liverpool Canal, Lancaster Canal, Bridgewater Canal, Rochdale Canal, Ashton Canal and Manchester Ship Canal. Several bus companies run bus services in the Lancashire area serving the main towns and villages in the county with some services running to neighbouring areas, Cumbria, Greater Manchester, Merseyside and West Yorkshire. The major settlements in the ceremonial county are concentrated on the Fylde coast (the Blackpool Urban Area), and a belt of towns running west-east along the M65: Preston, Blackburn, Accrington, Burnley, Nelson and Colne. South of Preston are the towns of Leyland and Chorley; the three formed part of the Central Lancashire New Town designated in 1970. The north of the county is predominantly rural and sparsely populated, except for the towns of Lancaster and Morecambe which form a large conurbation of almost 100,000 people. Lancashire is home to a significant Asian population, numbering over 70,000 and 6% of the county's population, and concentrated largely in the former cotton mill towns in the south east. † – part of the West Riding of Yorkshire until 1974This table does not form an extensive list of the settlements in the ceremonial county. More settlements can be found at Category:Towns in Lancashire, Category:Villages in Lancashire, and Category:Civil parishes in Lancashire. correspondingly, the former county borough of Stockport extended north into historic Lancashire, including areas such as Reddish and the Heatons (Heaton Chapel, Heaton Mersey, Heaton Moor and Heaton Norris). The Red Rose of Lancaster is the county flower found on the county's heraldic badge and flag. The rose was a symbol of the House of Lancaster, immortalised in the verse "In the battle for England's head/York was white, Lancaster red" (referring to the 15th-century Wars of the Roses). The traditional Lancashire flag, a red rose on a white field, was not officially registered. When an attempt was made to register it with the Flag Institute it was found that it was officially registered by Montrose in Scotland, several hundred years earlier with the Lyon Office. Lancashire's official flag is registered as a red rose on a gold field. Lancashire County Cricket Club has been one of the most successful county cricket teams, particularly in the one-day game. It is home to England cricket team members James Anderson and Jos Buttler. The County Ground, Old Trafford, Trafford has been the home cricket ground of LCCC since 1864. Historically important local cricket leagues include the Lancashire League, the Central Lancashire League and the North Lancashire and Cumbria League, all of which were formed in 1892. These league clubs hire international professional players to play alongside their amateur players. Since 2000, the designated ECB Premier League for Lancashire has been the Liverpool and District Cricket Competition. Football in Lancashire is governed by the Lancashire County Football Association which like most County Football Associations has boundaries which are aligned roughly with the historic counties. The Lancashire clubs that were founder members of the football league are Accrington F.C., Burnley F.C., Blackburn Rovers F.C., Preston North End F.C., Everton, and Bolton Wanderers F.C. The Manchester Football Association and Liverpool County Football Association operate in Greater Manchester and Merseyside. Along with Yorkshire and Cumberland, Lancashire is recognised as the heartland of Rugby League. The county has produced many successful top flight clubs such as St. Helens, Wigan, Warrington and Widnes. The county was once the focal point for many of the sport's professional competitions including the Lancashire League competition which ran from 1895 to 1970, and the Lancashire County Cup which ran until 1993. Rugby League has also seen a representative fixture between Lancashire and Yorkshire contested 89 times since its inception in 1895. In recent times there were several rugby league teams that are based within the ceremonial county which include Blackpool Panthers, East Lancashire Lions, Blackpool Sea Eagles, Bamber Bridge RLFC, Leyland Warriors, Chorley Panthers, Blackpool Stanley, Blackpool Scorpions and Adlington Rangers. There are many archery clubs located within Lancashire. In 2004 Lancashire took the winning title at the Inter-counties championships from Yorkshire who had held it for 7 years. Lancashire has a long history of wrestling, developing its own style called Lancashire wrestling, with many clubs that over the years have produced many renowned wrestlers. Some of these have crossed over into the mainstream world of professional wrestling, including Shak Khan, Billy Riley, Davey Boy Smith, William Regal, Wade Barrett and the Dynamite Kid. Lancashire has a long and highly productive tradition of music making. 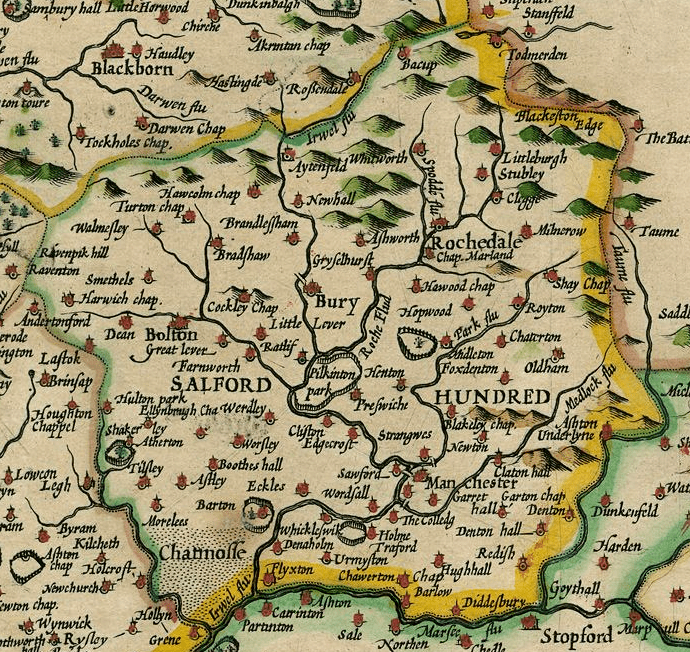 In the early modern era the county shared in the national tradition of balladry, including perhaps the finest border ballad, "The Ballad of Chevy Chase", thought to have been composed by the Lancashire-born minstrel Richard Sheale. The county was also a common location for folk songs, including "The Lancashire Miller", "Warrington Ale" and "The soldier's farewell to Manchester", while Liverpool, as a major seaport, was the subject of many sea shanties, including "The Leaving of Liverpool" and "Maggie May", beside several local Wassailing songs. In the Industrial Revolution changing social and economic patterns helped create new traditions and styles of folk song, often linked to migration and patterns of work. These included processional dances, often associated with rushbearing or the Wakes Week festivities, and types of step dance, most famously clog dancing. A local pioneer of folk song collection in the first half of the 19th century was Shakespearean scholar James Orchard Halliwell, but it was not until the second folk revival in the 20th century that the full range of song from the county, including industrial folk song, began to gain attention. The county produced one of the major figures of the revival in Ewan MacColl, but also a local champion in Harry Boardman, who from 1965 onwards probably did more than anyone to popularise and record the folk song of the county. Perhaps the most influential folk artists to emerge from the region in the late 20th century were Liverpool folk group The Spinners, and from Manchester folk troubadour Roy Harper and musician, comedian and broadcaster Mike Harding. The region is home to numerous folk clubs, many of them catering to Irish and Scottish folk music. Regular folk festivals include the Fylde Folk Festival at Fleetwood. Lancashire had a lively culture of choral and classical music, with very large numbers of local church choirs from the 17th century, leading to the foundation of local choral societies from the mid-18th century, often particularly focused on performances of the music of Handel and his contemporaries. It also played a major part in the development of brass bands which emerged in the county, particularly in the textile and coalfield areas, in the 19th century. The first open competition for brass bands was held at Manchester in 1853, and continued annually until the 1980s. The vibrant brass band culture of the area made an important contribution to the foundation and staffing of the Hallé Orchestra from 1857, the oldest extant professional orchestra in the United Kingdom. The same local musical tradition produced eminent figures such as Sir William Walton (1902–88), son of an Oldham choirmaster and music teacher, Sir Thomas Beecham (1879–1961), born in St. Helens, who began his career by conducting local orchestras and Alan Rawsthorne (1905–71) born in Haslingden. The conductor David Atherton, co-founder of the London Sinfonietta, was born in Blackpool in 1944. Lancashire also produced more populist figures, such as early musical theatre composer Leslie Stuart (1863–1928), born in Southport, who began his musical career as organist of Salford Cathedral. More recent Lancashire-born composers include Hugh Wood (1932– Parbold), Sir Peter Maxwell Davies (1934–2016, Salford), Sir Harrison Birtwistle (1934–, Accrington), Gordon Crosse (1937–, Bury),John McCabe (1939–2015, Huyton), Roger Smalley (1943–2015, Swinton), Nigel Osborne (1948–, Manchester), Steve Martland (1954–2013, Liverpool), Simon Holt (1958–, Bolton) and Philip Cashian (1963–, Manchester). The Royal Manchester College of Music was founded in 1893 to provide a northern counterpart to the London musical colleges. It merged with the Northern College of Music (formed in 1920) to form the Royal Northern College of Music in 1972. Liverpool produced a number of nationally and internationally successful popular singers in the 1950s, including traditional pop stars Frankie Vaughan and Lita Roza, and one of the most successful British rock and roll stars in Billy Fury. Many Lancashire towns had vibrant skiffle scenes in the late 1950s, out of which by the early 1960s a flourishing culture of beat groups began to emerge, particularly around Liverpool and Manchester. It has been estimated that there were around 350 bands active in and around Liverpool in this era, often playing ballrooms, concert halls and clubs, among them the Beatles. After their national success from 1962, a number of Liverpool performers were able to follow them into the charts, including Gerry & the Pacemakers, the Searchers and Cilla Black. The first act to break through in the UK who were not from Liverpool, or managed by Brian Epstein, were Freddie and the Dreamers, who were based in Manchester, as were Herman's Hermits and the Hollies. Led by the Beatles, beat groups from the region spearheaded the British Invasion of the US, which made a major contribution to the development of rock music. After the decline of beat groups in the late 1960s the centre of rock culture shifted to London and there were relatively few local bands who achieved national prominence until the growth of a disco funk scene and the punk rock revolution in the mid and late 1970s. Black peas, also known as parched peas: popular in Darwen, Bolton and Preston. Bury black pudding has long been associated with the county. The most notable brand, Chadwick's Original Bury Black Puddings, are still sold on Bury Market, and are manufactured in Rossendale. Butter cake: slice of bread and butter. Butter pie: a savoury pie containing potatoes, onion and butter. Usually associated with Preston. Clapbread: a thin oatcake made from unleavened dough cooked on a griddle. Chorley cakes: from the town of Chorley. Eccles cakes are small, round cakes filled with currants and made from flaky pastry with butter, originally made in Eccles. Fag pie: pie made from chopped dried figs, sugar and lard. Associated with Blackburn and Burnley, where it was the highlight of Fag Pie Sunday (Mid-Lent Sunday). Fish and chips: first fish and chip shop in northern England opened in Mossley, near Oldham, around 1863. Frog-i'-th'-'ole pudding: now known as "toad in the hole"
Frumenty: sweet porridge. Once a popular dish at Lancashire festivals, such as Christmas and Easter Monday. Goosnargh cakes: small flat shortbread biscuits with coriander or caraway seeds pressed into the biscuit before baking. Traditionally baked on feast days like Shrove Tuesday. Jannock: cake or small loaf of oatmeal. Allegedly introduced to Lancashire (possibly Bolton) by weavers of Flemish origin. Lancashire cheese has been made in the county for several centuries. Beacon Fell Traditional Lancashire Cheese has been awarded EU Protected Designation of Origin (PDO) status. Lancashire Flat Cake: A lemon flavoured sponge cake, traditionally made with a couple too many eggs, best eaten after being chilled. Nettle porridge: a common starvation diet in Lancashire in the early 19th century. Made from boiled stinging nettles and sometimes a handful of meal. Ormskirk gingerbread: local delicacy that was sold throughout South Lancashire. Parkin: a ginger cake with oatmeal. Pobs or pobbies: bread and milk. 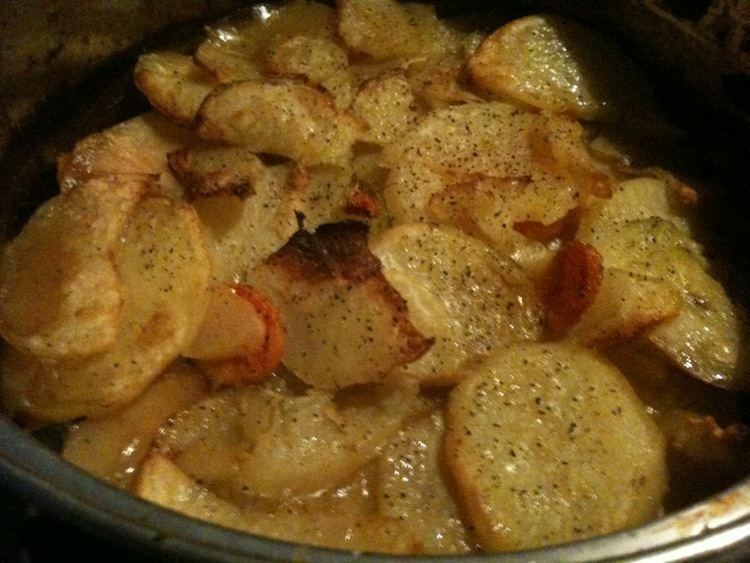 Potato hotpot: a variation of the Lancashire Hotpot without meat that is also known as fatherless pie. Ran Dan: barley bread. A last resort for the poor at the end of the 18th century and beginning of the 19th century. Rag pudding: traditional suet pudding filled with minced meat and onions. Sad cake: a traditional cake that may be a variation of the more widely known Chorley cake that was once common around Burnley. Throdkins: a traditional breakfast food of the Fylde. Uncle Joe's Mint Balls: traditional mints produced by William Santus & Co. Ltd. in Wigan. Whistle Down the Wind, 1961, was directed by Bryan Forbes, set at the foot of Worsaw Hill and in Burnley, and starred local Lancashire schoolchildren.